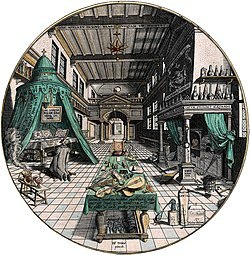 On 24 June the European Society for the Study of Western Esotericism (ESSWE) will organize a one-day workshop on alchemy in Amsterdam. Some of the top experts of alchemy will present papers, including Professor Lawrence Principe of John Hopkins University. Although the main focus is on alchemy and its ambiguous relation to early modern natural philosophy and religion, the workshop is intended for graduate and postgraduate students working with themes related to esotericism more generally. Since it coincides with the board meeting of the ESSWE, virtually all the leading scholars of western esotericism will be present, including Antoine Faivre, Wouter Hanegraaff, Nicholas Goodrick-Clarke, Boaz Huss, Mark Sedgwick, and Gyorgy Szonyi. They will all happily engage in discussions with students and young researchers. In short: A great opportunity if you’re doing an MA or PhD in this area, and can make it to Amsterdam in June. Another notable perk: It’s free. For more details, check out the announcement, which I also post in its entirety below.